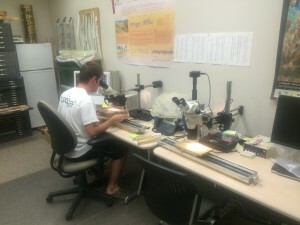 The dendrochronology laboratory at Utah State University was established in 2005 in response to a need for state-of-the-art tree-ring analysis capabilities. The primary purpose of the laboratory is to support and engage in scientific research based on tree-ring analysis. The lab also provides tree-ring-based services on a contract basis (contact). The dendrochronology laboratory has been an important source of meaningful employment for dozens of undergraduates and has contributed to undergraduate research. Over 450 square feet of dedicated lab space, including storage. 5-Stations equipped with Velmex stages, stereo microscopes, and digital measurement hardware connected to PC and Mac computing systems and utilizing the J2X measurement software. 1-PC Station equipped with a high-resolution flatbed scanner and CDendro software. An additional 200 square feet of dedicated wood processing space. 3-Belt sanders, 5-orbital sanders (3 electric, 2 pneumatic), 2-tabletop sanders (and all associated safety equipment). 2-Professional-grade chainsaws (and all associated safety equipment). ~3-dozen increment borers, from the 28-inch Haglof borer to our lab workhorses – 16 inch Haglof 3-thread, 0.515” diameter borers. The Tree-Ring Laboratory in the Department of Geography at Brigham Young University includes two complete Velmex digital stage measurement systems. This includes for each system: UniSlide stage with digital encoder, binocular or trinocular microscope, microscope illumination, digital display and connection between stage and computer and MeasureJ2X software for recording tree-ring widths. The lab also includes a microtome and transmitted illumination microscope, drying oven and muffle furnace, circular and reciprocating saws, multiple sanders and associated hardware for the preparation of tree-ring samples. All resources necessary for handling tree-ring samples and data are available, and multiple undergraduate students are employed at any given time to process samples and analyze data. Research computing facilities at Brigham Young University includes a full Geographic Information System (ArcMap) teaching and research lab, and the tree-ring laboratory includes both PC and Mac machines with all required software for analysis, as well as GIS software and support. The Department of Geography has multiple administrative assistants and is housed in the College of Family, Home and Social Sciences, with multiple computer system administrators. Global positioning systems, digital cameras, and laptops are available for fieldwork. In addition, multiple increment borers, chainsaws, and all the necessary hardware (e.g., straws, map tubes etc.) to collect increment cores and cross-sections are available from the tree-ring lab. Field researchers have access to field vehicles through BYU Motor Pool, and the Department of Geography has an all-terrain vehicle for access to remote sites.